Wesleyan’s Center for the Arts is the recipient of a $400,000 grant recognizing the CFA as an innovator and leader among arts organizations. The unsolicited gift from the Doris Duke Charitable Foundation is one of five—totaling $3.5 million—given to arts centers around the country. It recognizes these centers for their “adaptability” to changing conditions in the arts sector and is intended to support the groups’ ongoing capacity to respond to these changes, according to the foundation. “We understand that most organizations do not have enough, if any, ‘change capital’ —funds they can devote to maximizing their ability,” said Ben Cameron, program director for the arts at the foundation. These changes include conditions related to demographics, audience behavior, and the impact of technology. The grants were not open for application. An anonymous panel identified five organizations that demonstrated a sustained appetite to innovate and experiment. The support will be given over a period of up to four years, and appropriate uses of the money include staff expansion, creation of capital reserves, professional development, technology, board, and staff retreats, and consultants. 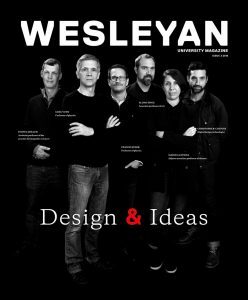 The grant counts toward Wesleyan’s multi-year, $400 million campaign celebrating access, inquiry, and impact. At this time the program is a unique, one-time event, according to the Doris Duke Foundation. The other grantees were the American Repertory Theater in Cambridge, Mass. ; the Oregon Shakespeare Festival in Ashland, Ore.; Wooly Mammoth Theatre Company in Washington, D.C. (where Howard Shalwitz ’74 is artistic director), and On the Boards of Seattle, Wash.